How many times have you driven down Main Street past the East Greenwich Town Hall and noticed the handsome stone and bronze memorial on the front lawn? Ever wondered how it got there and what it represents? 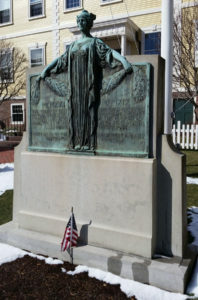 This gracefully-aging monument commemorates the World War I service of 183 East Greenwich residents who responded to the call to duty in the “war to end all wars” and commemorates five who died in the service of their country. Shortly after the World War I ended, a town meeting was convened to establish a Welcome Home event. The ever-active H.V. Allen was named chairman of the committee and co-chairman of the parade committee with his good friend, business partner and fellow Varnum Continental George Hanaford. Work quickly got underway on all components of the observance. A prominent sculptress of the period, Louise Allen Hobbs of Boston, was engaged to create a graceful, robed female figure cast in bronze and mounted on stone. The entire work stands on a granite base. In 1920, Ms. Hobbs also donated a sculpture valued at more than $200 to be raffled off during a major event that raised funds for improvements to the Varnum Memorial Armory Museum. MCMXVII MCMXIX The Town of East Greenwich erects this memorial in grateful remembrance of her citizens who served in the military or/naval forces of the United States or the allies during the World War. They carried on that liberty might be enjoyed throughout the world. The names of the 183 East Greenwich residents who served in various branches of the military are cast on a bronze plaque on the reverse side of the monument. At the time of the dedication, the monument itself was surrounded by plantings of cedar trees and ivy. A description of the monument is also recorded in the Smithsonian Museum of Art Inventory. Once work was completed on the monument, the next step was the dedication ceremonies to be preceded by a parade. Other events surrounding the dedication included a concert, reception, and banquet and a ball. According to the an account in the East Greenwich Packet, published in November of 1982 by the East Greenwich Preservation Society, the morning of October 22 dawned brightly following rain the night before. The parade formed on Peirce Street and marched down to Main Street and to what was then the Courthouse Building (now the East Greenwich Town Hall). The Varnum Continentals, of course, were well represented in the line of march. The dedication ceremonies themselves were brief but moving, according to published reports. Jesse A. Whaley, an Army veteran who was blinded in the war, was joined by several of his fellow soldiers in unveiling the monument. 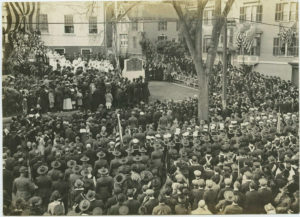 A large audience, including a contingent of town veterans, heard Judge George A. Loomis call the event “one of the proudest and gladdest days this old town has ever had.” A choir of schoolchildren sang “The Battle Hymn of the Republic.” Former Lieutenant Governor Roswell Burchard then gave the principal address, followed by music from Church’s Cranston Blues Band. Medal recipients at the World War I Memorial monument dedication ceremony in East Greenwich, RI. Following the dedication, Town Clerk George Loomis presented each soldier, sailor, and marine with a personalized bronze medal with the town seal on the front and a commemorative inscription reading “in grateful recognition of service” on the reverse side. After receiving their medals, the veterans posed for a group picture in front of the Varnum Memorial Armory. In what was probably the most moving moment to those present, a bugler played “Taps” for the five East Greenwich men who gave the ultimate sacrifice for their country and community: Marine Pvt. George Cleveland, National Guardsman Richard Grant, Navy Machinist Mate Victor Lorenson, Army Pvt. Fred Magoon, and Army Sgt. Cyril Mosher. The closing benediction was given by Sgt. Mosher’s father, The Reverend Gibson Mosher, who himself had enlisted as an Army chaplain after his son’s death. The names of father and son appear together on the memorial. Interestingly, there are several names missing from the monument of individuals who likely considered East Greenwich their home town, but by a fluke of chance and geography had lived on the east side of Division Street, which put them in Warwick, RI. 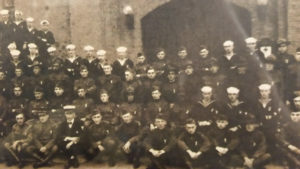 One was Navy Ensign Theodore Kilkenny, who was said to have been the first man in East Greenwich to enlist in the service. Richard S. Conover, World War I veteran from East Greenwich, RI. 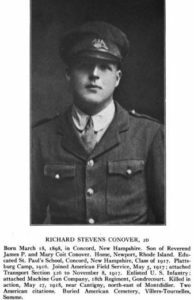 Another was Richard S. Conover, who had enlisted in the Army in 1917. He was the son of Rev. James Conover who had been the rector of St. Luke’s Episcopal Church (from which he later resigned). The 20-year-old Richard enlisted from Newport, a clue as to why he may not have been included in the memorial. He was killed in action on May 17, 1918, while serving as a machine gunner in the 18th Infantry Regiment near Cantigny, France. Ironically, his father visited the battlefield shortly after the war and located the spot where his son died. In an eerie circumstance, he found the remains of a mud-stained letter with “East Greenwich” on the corner. It was a letter he had mailed to his son. Richard is buried in an American military cemetery in France. His father later served as rector of St. Mary’s Church in Portsmouth, RI. He died in 1931 and was buried in that community. Another veteran, apparently overlooked on the monument, was Harriot Frances Drake. She had been called into active service as a “Yeomanette” in the U.S. Navy (women had been reluctantly accepted into the Navy – as well as the Army and Marines – to serve in support capacities and to free up men for combat duty). She served from May of 1918 until the end of the war. She died in 1998 at the age of 107. Harriot had been a member of the American Legion for 79 years. World War I Memorial monument dedication ceremony in East Greenwich, RI. There are a handful of surviving photographs of the monument dedication, one of which prominently shows the Varnum Continentals contingent. Apparently, there was also motion picture film shot of the event, according to the accounts of the ceremonies. These were later shown at the Star Theater. Sadly, the film has disappeared into the vacuum of time. 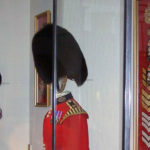 The Guard was created for home service during the war. Included was the 16th Company composed of the Varnum Continentals. The Museum also displays a newspaper article from The Pendulum recounting an effort to locate family members of 13 men whose medals had been discovered in a drawer in the East Greenwich Preservation Society’s offices. The article quotes our late Armory Museum Curator, Don Marcum, who said, “at the time (of the medal presentations), most of the towns were extremely patriotic with the town fathers wanting to do something for veterans. It was a different period in American history.” Perhaps, but the mission of the Varnum Continentals is simply that: “To Preserve Patriotism.” And we continue to carry out that mission. The author acknowledges the much-appreciated assistance from Rachel Peirce of the East Greenwich Preservation Society and from Bruce MacGunnigle in preparation of this article.